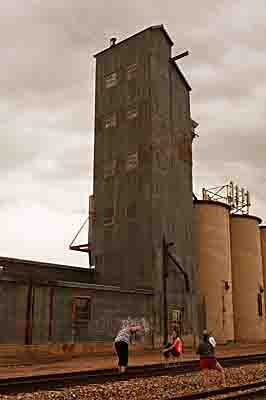 Photo Session, Old Tower, Broomfield, Colorado, copyright 2013 David Leland Hyde. Nikon D90. While junk dominates the internet in many categories of photography, some of the best photography ever made is also quietly being produced and published every day. Running a photoblog and networking with other blog writers has opened a whole new world. One blog I have grown to enjoy is Mark Graf’s Notes In The Woods. He must be one of the most innovative photographers around today. He shares tips, tidbits and techniques that keep photography interesting. Jim Goldstein also runs a good blog with a wider mix of interests, at least indirectly related to photography, including expertise in social media and internet marketing. Recently, about two months apart, both Mark Graf and Jim Goldstein wrote about the same topic. Mark Graf advised, “Always Do That 180” and Jim Goldstein published, “Pro Tip: Always Check The Views Behind You.” Multiple bloggers post about similar subjects from time to time, but it is rare enough to stand out. These blog articles, both advising to look behind you while you are photographing for additional photo opportunities, reminded me of my father, pioneer landscape photographer Philip Hyde, saying “a photographer has to look around.” Dad and other greats before him talked about looking in all directions. Mark Graf and Jim Goldstein are in good company. Their two blog posts triggered memories of my father in the field and how he approached making a photograph, as well as some advice given me by Stan Zrnich, one of Dad’s school associates under Ansel Adams and Edward Weston, while I photographed with him, and also a story about Imogen Cunningham told by one of Dad’s classmates, Benjamin Chinn. 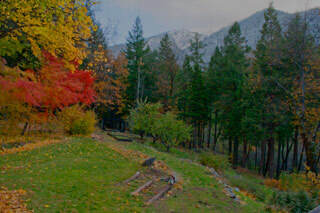 Right after I read the blog posts I was photographing in Indian Valley in the Northern Sierra. I climbed into the bed of my Datsun 4×4 King Cab pickup, set up my Bogen tripod and pointed my Nikon D90 camera at the fresh snow on Grizzly Peak. In a few minutes, I turned around and looked behind me. Clouds were just peeling away to allow the sun to touch Indian Head Peak on the other side of the valley. I might have missed it if I hadn’t been recently reminded to look back. When Dad was on the lookout for photographs, Mom and I were quiet in anticipation of the true quiet time, which began as soon as Dad pulled over and took out his Ziess wooden tripod and his 4X5 Baby Deardorff view camera, or the Hasselblad with Bogen tripod. He would say, “David, cut the chatter,” or “I can’t hear myself think,” or “Quiet on the Set.” While he was composing a photograph was one of the few times he asked me to be “seen and not heard. I remember him being in a different space mentally while in the act of making photographs. He kept a kind of intentional perimeter around the area he worked. Stepping into that circle was like walking into church: quiet and reverent. This working space was invisible but quite palpable, mainly made manifest by Dad’s attitude, emotional state and receptivity. In this enabling state of higher awareness, he missed nothing. When he first arrived on any scene he would look in every direction many times and at every detail of the countryside around him. He would bend down and look up at a tree, crouch and look at a flower between two rocks, scramble up on top of a nearby overlooking rock, all in the interest of seeing every angle. He did some of this in his mind and some physically moving around in the area. By the time he settled in and planted his tripod, you knew he had checked all other possibilities and chosen one. There were exceptions to this longer process such as when he saw one isolated point of interest or when the light was fading or the situation was changing quickly for some other reason. In these instances Dad could move with the swiftness and efficiency of a stealth reconnaissance unit and make the image, but most of the time he did a good deal of looking around first. The meditative state Dad adopted coincides with my experience in observing and photographing with Stan Zrnich, who also attended the California School of Fine Arts, now the San Francisco Art Institute, under Ansel Adams, Edward Weston and Minor White. Stan Zrnich and I took our cameras and went for a walk in downtown San Rafael, California one afternoon in July 2009. Stan talked about how Minor White taught his photography students to go into an altered state of heightened awareness when they photographed. That explained the roots of my father’s method. Stan’s calm mindset was evident in his tranquil facial expression and demeanor while walking around. He showed me numerous instances where I walked right by something photogenic, mainly because my mind was chattering on about what I thought I was looking for, what I wanted to accomplish that day by photographing and so on. Often in photography it is easy to get “stuck in the head” and become too analytical. People typically feel strong, alert, in effortless control, unselfconscious, and as if they were performing at the peak of their abilities. Both the sense of time and emotional problems seem to disappear. There is an exhilarating feeling of transcendence, of breaking out of the boundaries of identity. Flow and other sources teach photographers and other artists and creative people how to obtain this state any time on demand and how to control it, rather than merely leaving its arrival to chance. Through practice we can attain this state quickly at any time. My father described it as a state of receptivity in which he looked more closely at everything and saw objects more deeply. Not only did he see the graphic qualities of subjects and what they would look like transformed into the two-dimensional plane of the photograph, but he also saw the very nature of the subject matter more deeply as well and could thereby depict it more effectively in his art. This relaxed mindset is not complex or dependent on ceremony, it can be started quite easily through deep breathing or other methods of relaxation and available by recall the more it is practiced. This is the art of seeing in photography, pirouetting in dance, or “getting air” in ski jump competition. It is the main event in any endeavor where results improve with concentration. Photographers who are in a heightened space for seeing do not miss anything in any direction. I saw this first hand from observing Dad and Stan Zrnich, They and their comrades learned it from Minor White and Imogen Cunningham in their day. Benjamin Chinn, one of Dad’s classmates known for photographing the streets of San Francisco’s Chinatown and of Paris, France, said that the “quiet mind” was responsible for much of his success in capturing people and moving events well. He said that one of his mentors, Imogen Cunningham, had made herself available for photo walks during photography school. When Minor White arrived at the right place in the curriculum, Imogen Cunningham took the students out for one or two hour walks to show them what they would have missed… and they missed a lot at first, but as their seeing strengthened over time, their images improved and they missed less and less. What is your experience? Do you photograph better when relaxed and focused, or sometimes better when you’re in a hurry? Do you pre-visualize and plan or allow images to appear as you wander? While Photography as an art form has matured and found substantial space in most major museums, more people make and share photographs than ever before with the proliferation of digital cameras and camera phones. Interest in collecting photography has also grown dramatically, not to mention the value of some photographs. The art of collecting photography has followed the medium in an upward climb in popularity throughout its existence. But how did photography collecting begin? Who were the first collectors? What types of photographs were the first collected? Why were daguerreotypes so popular? Rough Rock Lower Lawn, Maples, Fall, Shoulder of Grizzly Ridge, Northern Sierra Nevada, California, copyright 2011 by David Leland Hyde. Back to the Land movement leaders, Helen and Scott Nearing in Living the good Life: How to Live Sanely and Simply in a Troubled World , share a living philosophy based on self-reliance and living a simple life sustained by farming the land. Ardis and Philip Hyde studied many such books and ways of life and found Helen and Scott Nearing’s model most relevant to the Hyde’s home lifestyle, including daily pace and schedule, food preservation and organic gardening. In the previous blog post, “Living The Good Life 1,” Nancy Presser and David Leland Hyde wrote about how Helen and Scott Nearing led the Back to the Land movement of the 1950s and how Ardis and Philip Hyde in turn implemented the Nearings’ philosophy. While delving into the first chapter of Living the good Life: How to Live Sanely and Simply in a Troubled World , Nancy found that Helen and Scott Nearing were writing for someone just like her, a city person that had ideas of living a simpler life. Helen Nearing wrote, “…A couple, of any age from twenty to fifty, with a minimum of health, intelligence and capital, can adapt themselves to country living, learn its crafts, overcome its difficulties, and build up a life pattern rich in simple values and productive of personal and social good.” Nancy wondered about Ardis and Philip Hyde. Were they from the city or the country? Why did they choose to adapt to their own situation, Helen and Scott Nearing’s lifestyle and philosophy? David explained that his mother, Ardis, grew up in the suburbs of Sacramento, California, when Sacramento was a small town that couldn’t even be called a city. About 15 miles from downtown, in the rural countryside lay the Van Maren Ranch. The Van Maren Ranch House sat in the center of the Van Maren Ranch on a small hill that was later removed and is now a shopping center in the town called Citrus Heights, California. Ardis visited the ranch often with her family. David’s grandmother, Ardis’ mother, Elsie Van Maren King, had grown up on the ranch with her three sisters and no brothers. The four Van Maren girls learned to do all of the chores that boys usually do, and when Ardis came along, and later her brothers, grandma taught her all the ranch chores that boys usually did too. David’s mother from a young age was very competent around animals, farm equipment and anything outdoors. Ardis’ father, Clinton S. King Jr., loved the outdoors and loved to go camping. All of the Kings grew to love camping in the Sierra, except grandmother, who went along, but never liked it much. Philip and Ardis Hyde were both from the city, but both had an affinity to the country. Both had roots in camping, farming and wilderness. They both developed a love for the outdoors and even though their experience was somewhat limited then compared to later, they felt at home enough in nature’s company to seek more of it. Many people of all walks of life with much less experience easily learn to thrive in the country, but some connection to nature and the value of being close to nature, lends them the desire that carries them on to further learning and becoming accustomed to country life. Aesthetically, we enjoy the procession of the seasons. In any other part of the country we would have missed the perpetual surprises and delights to which New England weather treats its devotee… The land that has four well-defined seasons cannot lack beauty, or pall with monotony. Physically, we believe the changing weather cycle is good for health and adds a zest to life… Geographically, we found New England in closer contact with the Old World, from which we did not wish to sever connections. 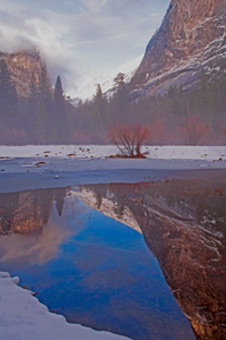 Mirror Lake, Mist, Winter, Yosemite National Park, Sierra Nevada, California, 2010 by David Leland Hyde. Nikon D90. For the next 10 or more years, in some ways the rest of my life, I have my work assignment: representing my father, prominent Western landscape photographer Philip Hyde. Also, you may or may not notice from this blog, but I consider myself a writer first and a photographer as a sideline, at least for quite some time to come. 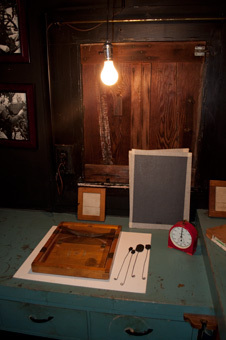 Edward Weston’s Darkroom, Wildcat Hill, Carmel Highlands, California, 2010 by David Leland Hyde. Nikon D90. My secret to making it into print in the past was to edit several more times than I do when I write blog posts. However, I haven’t made any print or online magazine submissions recently. 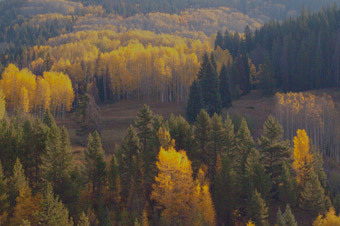 Fall Color, Summit County, Rocky Mountains, Colorado, 2010 by David Leland Hyde. Nikon D90. Even though I am still interviewing people for my book, I hope to get a chance to do more regular magazine writing this year. Perhaps I will even write about other interests besides my father, his photography and life, as is my focus here and during the majority of days. 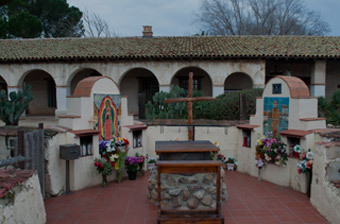 Mission San Miguel De Arcangel, Paso Robles, California, 2010 by David Leland Hyde. Nikon D90. Neighbors, San Francisco, California, 2010 by David Leland Hyde. Nikon D90. 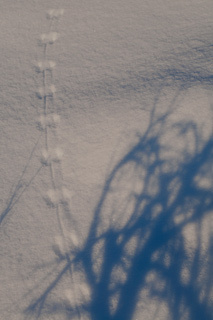 I am discovering that I greatly enjoy the photography blogosphere. The community is diverse yet generally friendly and helpful to each fellow blogger. Each photo blogger benefits from the network and contributes as well. Each blogger has something to teach and something to learn. Like minds tend to come together and those who differ widely also cross-pollinate methods and ideas and friendships develop. Through the process I am catching a more serious case of the photography bug all the time. I make photographs in my spare time, about five minutes a month. 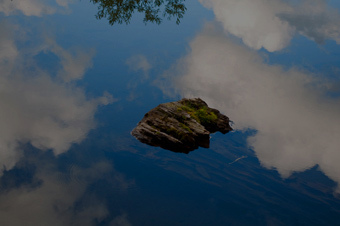 Reflection Detail, Manzanita Lake, Lassen Volcanic National Park, California, 2010 by David Leland Hyde. Nikon D90. I photograph a combination of subjects and do not limit myself to a certain genre or type of photography like many “experts” suggest. My father knew how to specialize. His type of landscape photography was ideal for him. His work was also part of one of the biggest changes in photography to come along, besides perhaps what is happening now and when negatives changed from glass plates to film. Digital photography today, besides being much easier than film, is also more freeing, providing the flexibility and opportunity to pursue various branches of photography and often combine them in new ways. 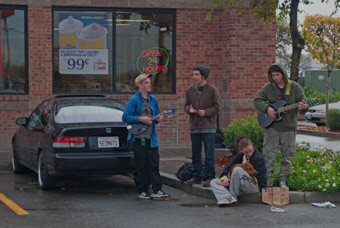 Fast Food Traveling Band, Travel Stop On Interstate 5, Northern California, 2010 by David Leland Hyde. Nikon D90. The Road To Mt. 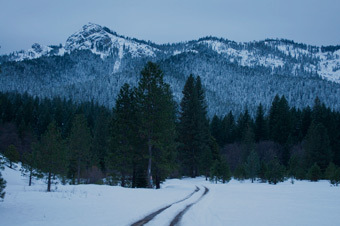 Hough, Northern Sierra Nevada, California, 2010 by David Leland Hyde. Nikon D90. I was fortunate to grow up in the wilderness. 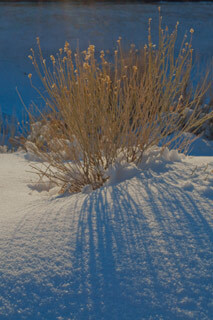 I find because natural surroundings are my roots that I naturally photograph the natural scene. However, I also notice that I am drawn to photograph people, and people in nature. I am attracted to social activism as well as environmental activism. If I were to pursue photography full-time rather than writing, or more than writing, the ideal life for me would be as a freelance photojournalist. I would be on the plane as soon as news broke of the BP Oil Spill, down there right in the oil slick with the workers and dead birds. Or I could see photographing inner city poverty and homeless people, or the dot com collapse, hurricanes, earthquakes, environmental disasters, as long as I wasn’t sensationalizing other people’s misfortunes, but doing something to help them. 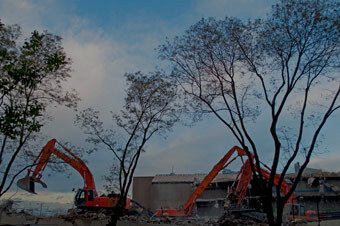 Colorado Cleanup Demolition, Downtown Denver, Colorado, 2010 by David Leland Hyde. Nikon D90. These photographs show where my vision is at this time after making digital photographs for just under two years and film photographs off and on for most of my life. Most of the images here are camera raw or close to it with only a few minor adjustments. One of my favorite photography quotes not by my father is, “To see color as form means looking at the image in a new way, trying to free oneself from absorption in subject matter.” –Cole Weston. This quote is part of what I’m about in my photography and will substitute for my own artist’s statement until I write one. Summit Sunset, Loveland Pass, Rocky Mountains, Colorado, 2010 by David Leland Hyde. Nikon D90. I remember the evening I made this photograph. 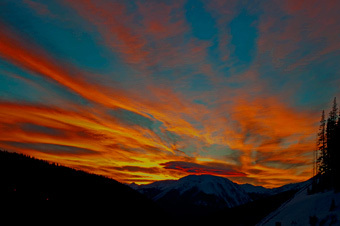 I had just that morning been commenting that sunsets are cliche and voila: one of the most amazing sunsets I have ever seen was waiting for me just as I emerged from the Loveland Pass Eisenhower Tunnel. I was in the fast lane and literally skidded to a stop in about a foot of snow and flying powder on the center median to make this photograph. Fortunately I was in my 4X4 truck or I would not have made it back onto the pavement without a tow. 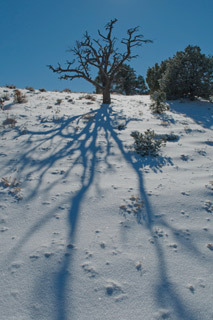 “Freeing oneself from absorption in subject matter,” is nearly the opposite of what my father was doing with a camera. His photography was primarily about place and as Emerson put it, “the integrity of natural objects.” I would expand my statement to include the integrity of all objects, as well as the breakdown, disintegration and rearrangement of all objects. 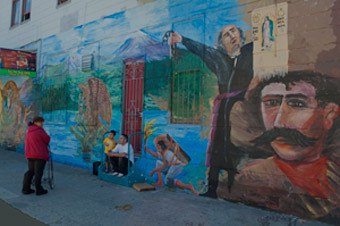 Not to mention the celebration of place without attachment to place or to subject matter in the photograph. 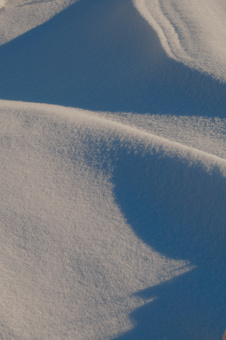 Snow Cornice Detail Along Highway 50, Nevada, 2010 by David Leland Hyde. Nikon D90. Sometimes it pays off to be out driving across several states after a fresh snowfall. Amazingly, even though I drive back and forth from California to Colorado a few times a year, I still drive fewer than 8,000 miles a year, significantly less than the average American at just over 12,000 miles a year. 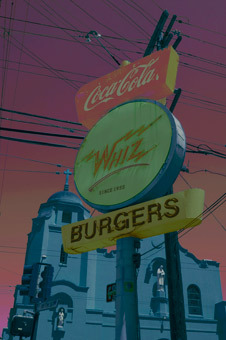 Whiz Burgers, San Francisco, California, 2010 by David Leland Hyde. Nikon D90. Something about fast food, the Catholic Church and all those electric wires powered by San Francisco’s electricity grid set me onto going for an apocalyptic sky look. 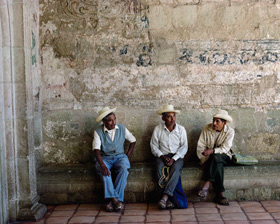 Men Of Oaxaca Waiting For The Train, City Of Oaxaca, State Of Oaxaca, Mexico, 1990 by Philip Hyde. When I first discovered this photograph in Dad's files, it did not have a name or description but it was in the Oaxaca section. I called it "Men of Oaxaca." I didn't even know where it was in Oaxaca. However, I found it in the Travel Logs called, "Waiting For The Train, Oaxaca Train Station." This is what it is now called on the website. However, I have been referring to it on the blog as, "Men Of Oaxaca Waiting For The Train" so that people know it is the same photograph. Eventually I will drop "Men of Oaxaca" because we don't really know if they are from Oaxaca or not. They are just waiting in the train station. Clear skies on takeoff from Denver. The Airbus to Houston left more than half an hour late. The wide body plane had seats seven and eight abreast at intervals. We had two seats, one by a window. We could see the front range of the Rockies, pure white with fresh snow. Despite a tail wind, we arrived late in Houston. It was very slow deplaning. We hurried through the huge terminal searching for our gate. We inquired of a courtesy car and the driver told us to hop aboard. We would never have made it without his help. It was a long way to the gate. We were the last to board and almost missed our flight. Clouds covered Mexico City solidly. On the ground in Mexico City, where we arrived on time, we groped around finding our way. We bought pesos and finally exited customs after filling out many forms but moving quickly past the officials. Dusk brought heavy traffic negotiated by taxi to the Ritz Hotel at Madera 30: $43.50 a night with senior discount. Room 510 was quiet and appointed well but not fancy. We were exhausted from the trip and went to bed early. The Hydes attended the Epiphany, 12th Day of Christmas and Dia de Reyes, gift giving to children. They explored the Museo de la Ciudad de Mexico and many other museums. They tried staying in different hotels. They saw the “beautiful glass ceiling of the Gran Hotel,” and visited the Universidad to make photographs of the Diego Rivera murals on the library exterior. They took the autobus to the Teotihuacan Pyramids. At the train station we visited in line with two Americans Philip recognized from our hotel, as well as Earl and Shirley Binin, our friends from Connecticut, all boarding the same train to Oaxaca. The train to Oaxaca pulled out promptly at 7:00 pm. We had a neat ‘Alcoba,’ sleeper room and dinner included with our ticket. The diner car was neat and clean. After a visit in the diner car with the Binins we went off to our Alcoba to go to bed early. It was a bumpy ride all night. The train never went very fast. I was in the upper bunk and Philip took the lower. We slept OK. We woke up early and watched the daylight appear through the train windows. Outside we saw mountains, a river gorge and flowing streams through a forest of Kaypok trees. We had breakfast at 7:15 am as the train progressed out onto cultivated flatter terrain. We arrived in Oaxaca at 9:30 am. Philip made photographs in the Oaxaca train station. One was of three men waiting for the train. They were as weathered and tired-looking as the old worn wall of the train station behind them. Hal Gould In The Camera Obscura Gallery, 2002, by Kurt Edward Fishback. 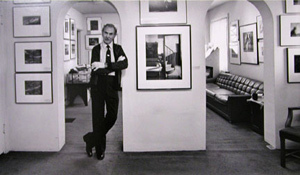 For nearly 50 years, Hal Gould has operated showcases for fine art photography. In 1963, he founded the non-profit Colorado Photographic Art Center — one of the first venues in the world devoted exclusively to showing and promoting photography as a medium for fine art. In 1979, the center transformed into The Camera Obscura Gallery, today still in its original location at 13th Street and Bannock Street in Denver, Colorado. Camera Obscura Gallery has since built a reputation for exhibiting masters such as Ansel Adams, Edward Weston, Brett Weston, Andre Kertesz, Manuel Alvarez Bravo, Imogen Cunningham, Paul Strand, Edward S. Curtis, Sebastiao Salgado, Philippe Halsman, W. Eugene Smith and many others. Hal Gould’s collection at the gallery is one of the most diverse between the East Coast and West Coast of the United States. The collection on display at Camera Obscura contains some of the earliest photographs starting in 1839, with a large selection from the 1800s and early 1900s. The Colorado Photographic Art Center and the Camera Obscura Gallery have held exhibitions of the work of many prominent western photographers, one of whom was Philip Hyde as part of a group show in the early 1970s. 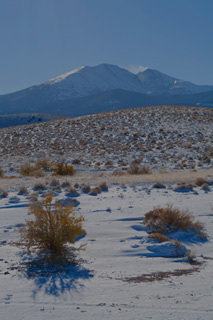 The Camera Obscura Gallery now has on display a 16X20 archival fine art digital print of Philip Hyde’s 1971 “Mt. Denali, Reflection Pond, Denali National Park, Alaska.” Philip Hyde’s artist statement, biography and other information is now listed under artists on the Camera Obscura Gallery website. The Camera Obscura Gallery also has a magnificent portfolio book of 8X10 archival fine art digital prints of 47 of Philip Hyde’s best photographs. Hal Gould’s long experience in both commercial and fine art photography, and collecting, has helped Camera Obscura Gallery become a center for learning and viewing by visitors from all over the world. A large contingent of volunteers help keep Camera Obscura Gallery vibrant with new shows, and with publication of the Photography in the Fine Arts Newsletter authored by Hal and his associate, Loretta Young-Gautier. The newsletter is distributed by regular mail to over two thousand art lovers and collectors worldwide. Hal Gould, a photographer and artist himself, trained as a portrait painter at the Art Institute of Chicago in the 1940s. Inspired by the work of Alfred Stieglitz and Man Ray, he also studied photography at the Art Institute of Chicago and at Ray Vogue School of Photography. He then operated his own commercial studio for 25 years, photographing a in wide range of styles from portraits to architecture. Camera Obscura Gallery’s assistant director, Loretta Young-Gautier, is also a photographer and has worked with Hal Gould for 15 years as assistant curator, book-buyer and editor of the Photography in the Fine Arts Newsletter. She studied with several masters of Darkroom manipulation including multiple image master Jerry N. Uelsmann. 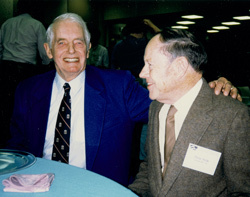 David Brower and Philip Hyde at 2000 NANPA Summit by Ardis Hyde with throw away camera. Both David Brower and Philip Hyde received Lifetime Achievement Awards from NANPA for their contributions to conservation. Their collaboration began on a 1950 Sierra Club High Trip. The first major battle over Dinosaur National Monument, many have said, ushered in the age of modern environmentalism. Such notables as Pulitzer Prize winning novelist Wallace Stegner, Sierra Club Leader, photographer and journalist Martin Litton and others also led the fight. …Meanwhile three states away, in the remote northeast corner of Utah, the town of Vernal, like many other small towns around the West, celebrated the possibility that it would soon become a boomtown too. In 1948 the Upper Basin Compact between the states of Colorado, Utah, Wyoming and New Mexico, divided the upper basin share of the Colorado water. By 1950, the Bureau of Reclamation or “Bureau of Wreck The Nation” as environmentalists called it, had plans for ten dams in the Upper Colorado River Basin. Vernal was the closest town of any size to two dams proposed on the Green River within the boundary of Dinosaur National Monument, one at Split Mountain and one at Echo Park. The Bureau of Reclamation enlisted the political support of Vernal businessmen for the nearby dams that would in turn prosper the local economy. National Park Service Director Newton Drury felt that the National Park Service must respond to the local desire for water development and avoid a direct confrontation with the Bureau that might lose Dinosaur National Monument irrevocably to dams. The two proposed dams would have inundated 91 out of 101 river miles within the monument. Newton Drury thought the monument boundaries could be redrawn or a compromise secured at the last minute. Therefore, he went along with Bureau of Reclamation plans and “signed a secret ‘memorandum of understanding’ which essentially stated that the National Park Service would not interfere with water projects in Dinosaur National Monument or in Grand Canyon National Monument,” Reported Jon Cosco in Echo Park: Struggle For Preservation. Richard Leonard, Executive Board Member and Secretary of the Sierra Club, also was elected to the council of the Wilderness Society in 1948. Leonard attended the Wilderness Society’s annual meeting in 1950, held in Twin Springs, Colorado. After the meeting, the founders of the Wilderness Society, Olaus and Margaret Murie, Richard Leonard and others visited Dinosaur by automobile. They approached by U.S. Highway 40 from the East. U.S. Highway 40 rolls across Northern Colorado over arid auburn hills and plateaus covered with sagebrush and an occasional squat Juniper tree. The faint taste of powdered-dry dirt underlies the sweet earthy smell of sage. Low plateaus rise in the distance. Sculpted sandstone cliffs stand in tans, pinks and browns against the azure sky where tufted clouds flirt with the sun. The open vistas periodically collapse into eroded gray-brown clay badlands where flash flood torrents tear gullies and gashes in the open land. Today, beyond the billboards at the eastern edge of the town of Dinosaur, Colorado, across the Utah-Colorado Border from Vernal, a small sign for Harper’s Corner points north along a two lane road that in 1950 was a dirt track. Immediately on the right of the Harper’s Corner road, the Dinosaur National Monument Headquarters and Visitor Center, a tan stone building blends into the surrounding sage. U.S. 40 is not a heavily traveled route and people passing by the Harper’s Corner turnoff must watch carefully or miss Dinosaur National Monument completely. The gentle sloping terrain offers no hint of the vast sculpted canyons of the Yampa River and Green River, the monument’s scenic highlights less than 20 miles to the North. “Dinosaur is one of the best places in the country to observe the stars,” Sue Walter says in her Park Ranger talk at the Visitor Center, “because of its great distance from any city lights: four hours by car from Denver and six hours from Salt Lake City. Dinosaur in still air is quieter than a Hollywood sound stage,” For many decades after Woodrow Wilson legislated the monument in 1908, ranchers and a few paleontologists were the only people that set foot in the area. 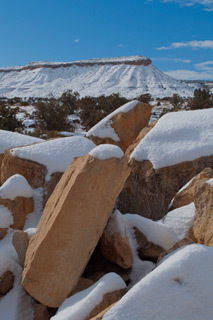 The majority of visitors today experience only the Dinosaur Quarry on the Utah side of the monument, approached from the West Entrance road out of Jensen, Utah. The Dinosaur Quarry is the world’s largest excavation site preserved indoors and the origin of the most dinosaur bones in museums in the United States. A 300 foot long steel-beamed concrete roof with steel-framed glass walls protects an acre-plus of hillside containing fossil remains in a half-excavated state. A shuttle takes sightseers from the Quarry parking lot up to the museum, and by way of recorded message takes people “back in time 150 million years” to a period when an ancient river flowed northeast toward a distant sea, the opposite direction of the Green River today. In our current geological age, the Green River flows south and the Yampa River joins the Green River from the northeast. Over millions of years the plateau gradually uplifted more than 4,000 feet, while the rivers lazily cut deeper, maintaining the gentle meanders characteristic of rivers with a gradual vertical drop. The wide river bends carved from sandstone are unusual because rivers usually cut through bedrock in steep gradients that form straighter, more V-shaped canyons. The canyons of Dinosaur National Monument reveal even more geological time than the Grand Canyon, more than a billion years of rock layers, Ranger Sue Walter also explains. The best way to see the carved scenery is by river boat and the Wilderness Society group did this one day. They also did as people often do today, they viewed the canyons by driving in from the Colorado side out of the town of Dinosaur, following the Harper’s Corner Road to the plateau top and beyond, skirting the river canyons for a total of 32 winding miles one-way to Harper’s Corner Overlook. This route branches into side roads to various overlooks and ends one mile shy of the pastel-red-to-tan 2,300 feet tall sheer walls of Harper’s Corner. Twenty-six miles from headquarters, a rough dirt road plunges down the cliff face through Sand Canyon to a homestead ranch, then on down to the Green River and Echo Park, the verdant “heart of Dinosaur.” Echo Park was named by John Wesley Powell, its first White explorer, because John Wesley Powell noticed that his men’s voices echoed off the side of Steamboat Rock. Echo Park is the focal point of the labyrinthine canyon country where a nearly 800-feet-tall-squared-off loaf of rock called Steamboat Rock stands as Dinosaur National Monument’s most prominent landform. The rough dirt road into Echo Park forks into other rougher roads only passable by four-wheel-drive vehicles. These sometimes muddy and often rocky tracks provide a closer look at various grottos and valleys of the Yampa river canyon. Here the canyon rises red, orange, tan, yellow, gray, pink, black and brown in painted sandstone walls. Exposed are over one billion-years of strata, the many-color stained river undercuts and the oasis called Echo Park or the Grand Overhang on the Yampa River, where a rock dropped from the top lands on the opposite bank at low water flow in the summer and fall.